This caramel apple pie cheesecake incorporates the best of an apple pie and cheesecake all rolled into one delicious treat! This dessert is as heavenly as it sounds. It’s very rich and even for the sweetness addict one piece is enough. However,when you do eat it you will be in bliss. This desert can be a bit of a process but you won’t feel it and honestly is worth every second you spend on it. I have been making it for years and it has become a family favorite. You can use store bought but this deliciousness is one of a kind and I highly recommend taking the homemade route. To make the caramel sauce, combine the butter, heavy cream and brown sugar in a medium heavy-bottomed saucepan over medium-high heat. Bring the mixture to a boil, stirring constantly. Once it reaches a boil, lower the heat to medium and continue to boil until the mixture is thickened, about 8 minutes. Remove from heat and let cool. Preheat the oven to 375° F. Line the bottom of a 9-inch round springform pan with parchment paper. In a medium mixing bowl, combine the graham cracker crumbs, sugar, cinnamon and melted butter. Toss with a fork until all the crumbs are moistened and the ingredients are evenly mixed. Transfer the mixture to the prepared springform pan and press the crumbs in an even layer over the pan bottom and about half to two-thirds of the way up the sides of the pan. Bake for 6-8 minutes, until golden in color. Let cool for about 10 minutes. Pour a layer of caramel into the bottom of the crust and sprinkle evenly with the chopped pecans. Refrigerate the crust while you prepare the filling. To make the cheesecake layer, combine the cream cheese and sugar in the bowl of an electric mixer and beat on medium speed until smooth, about 1 minute. Mix in the vanilla, egg and lemon juice until fully incorporated and smooth, 1-2 minutes. Spread the cheesecake filling into an even layer over the top of the cooked apples in the crust. Bake until a knife inserted in the center comes out clean, about 30 minutes. Remove from the oven, transfer to a wire rack and let cool to room temperature. Refrigerate for at least 4 hours. Carefully remove the sides of the springform pan. For the Topping, beat the heavy cream and confectioners’ sugar on medium-high speed until stiff peaks form. Spread gently over the top of the chilled cheesecake layer. Top with caramel sauce . Sprinkle with a handful of chopped nuts, if desired. I just ate an apple with caramel sauce with lunch today! This looks equally wonderful! wow this combines my faves of apple pie and cheesecake! This looks so good I’m thinking everyone will be talking about it all year – I must make at least two – one for me, me, me, and one for sharing!!! This looks insanely good. I love apples and cheesecake! Oh my! This looks so yummy!!! I am going to have to try this!!!! oh my goodness gracious this looks simply amazing! i will HAVE to try this! thanks!!! This looks fantastic, I will have to make this soon. Caramel and apple is probably my favorite combination out there. YUM! OMG.. this looks amazing! 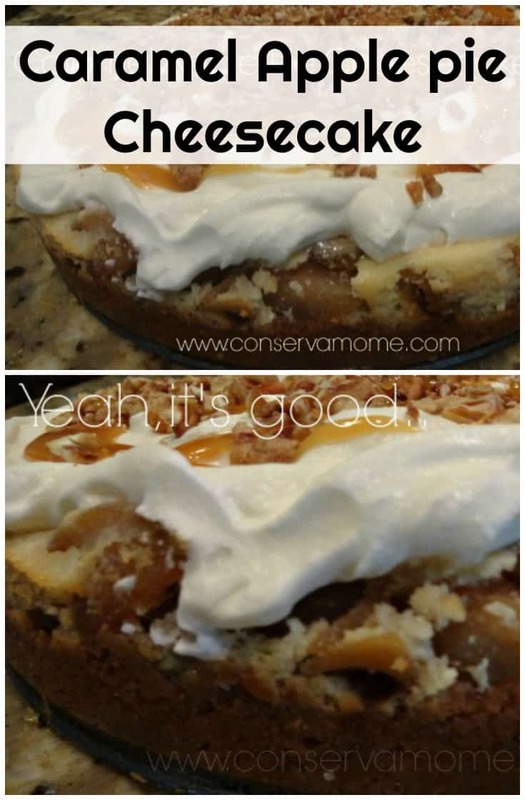 The hubby would love this…pinning, so I can make it later! Thanks! I will make this for my dad and he will blow his cholesterol check I’m fairly certain. I made this and it was amazing. Thanks! Oh I love a good cheesecake recipe! Can’t wait to give this one a try! That looks so good, thank you for sharing this with us. Looks like a pretty doable recipe for a decadent dessert. Thanks for the recipe. This is one of those recipes that leaves out the calories, isn’t it? I looks so delicious and the ingredients even made my mouth water. This sounds heavenly. Thanks for the recipe. Holy moly, this looks so good! I love cheesecake. This will need to be the recipe I try next! Thanks! looks so easy and so tasty! Cant wait to try it! This looks so delicious! I have to try it. My husband would love this cheesecake. Thank you for sharing your recipe. Holy cow, this look rich + delicious! Gonna have to try this one for sure! Where was this recipe during the holidays?! Lol. It looks amazing!! This looks absolutely divine! Not sure if the children would like it, but that is okay, more for the hubby and I.
I would love for you to stop by and share on this week’s Kids and a Mom in the Kitchen. This sounds so good, I think I might make it before I really buckle down to loose baby weight! I will be trying this out!!!!! OMG!! My 2 favorites, caramel apple & cheesecake.. I can not wait to make this!! Thank u so much for sharing this!!! Oh my goodness! This looks incredibly delicious! I wish my husband liked cheesecake! Maybe I could eat one by myself! lol Or I could make a smaller version!